The Caspian Sea region is one of the oldest oil-producing areas in the world and is quickly growing as a natural gas production hub. The Caspian Sea region is one of the oldest oil-producing areas in the world and is an increasingly important source of global energy production. The area has significant oil and natural gas reserves from both offshore deposits in the Caspian Sea itself and onshore fields in the Caspian basin. Traditionally an oil-producing area, the Caspian area's importance as a natural gas producer is growing quickly. This report analyzes oil and natural gas in the Caspian region, focusing primarily on the littoral (coastal) countries of the Caspian Sea (Russia, Azerbaijan, Kazakhstan, Turkmenistan, and Iran). A discussion of Uzbekistan is also included. While not a Caspian coastal state, a considerable amount of Uzbekistan's territory, along with its energy resources, lies in the geological Caspian basins. Aside from Azerbaijan's oil production, the Caspian Sea largely was untapped until the collapse of the Soviet Union. With several newly independent countries gaining access to valuable hydrocarbon deposits, the different countries have taken diverging approaches to developing the energy resources of the area. At the same time, the lack of regional cooperation between the countries' governments and few export options for Caspian hydrocarbon resources have slowed the development of Caspian oil and natural gas resources. The combination of foreign investment and rising energy prices allowed the coastal countries to shift from diverting oil extraction for local use to supplying both regional and world oil markets. The ability of countries to export greater volumes of Caspian crude oil and natural gas will depend on how quickly domestic energy demand rises in those countries, how quickly they can build additional export infrastructure to global markets, and whether expensive projects to develop Caspian resources can attract sufficient investment. With the dissolution of the Soviet Union, its successor states diverged in their approach to managing the oil and natural gas sectors of their countries, ranging between private ownership and full state control. Historical records reveal primitive oil extraction on the Apsheron peninsula near Baku dating back hundreds of years. The Caspian became a significant source of oil production for the Russian Empire, and subsequently the Soviet Union. Its share of world supply fell in the second half of the 20th century because of stagnating growth and interest in new oil-rich areas such as West Siberia. The Caspian Sea and its surrounding area regained the world's attention after a consortium of international oil companies led by BP signed a deal with Azerbaijan to develop the country's offshore reserves and discovered the giant Azeri-Chirag-Guneshli (ACG) field. Since then, Caspian fields have seen an influx of investment into major projects such as Kazakhstan's Kashagan field. The Caspian Sea is the world's largest inland water body. The Caspian Sea is the world's largest endhoreic (inland) water body and contains more than 40 percent of the world's inland waters, according to the United Nations Global International Waters Assessment (GIWA). It has five littoral (coastal) countries – Russia, Azerbaijan, Iran, Kazakhstan, and Turkmenistan. Rivers from the sea also discharge into Georgia, Armenia, and Turkey. Broadly speaking, four main geological basins make up the Caspian Sea area – the northern, middle, and southern Caspian basins, and the North Ustyurt basin. The northern basin, which encompasses just over a quarter of the sea's surface area, is shallow in depth. This part of the Caspian is frozen nearly half of the year and fast-drifting ice in the shallow water makes exploration projects more difficult. Water depth is greater in the southern portion of the sea. The Mangyshlack Shelf separates the northern basin from the middle basin. This basin makes up about 38 percent of the surface area. The Apsheron Shelf, which is a continuation of the Caucasus mountains, separates the middle and southern basins. The southern basin has a maximum depth of 3,363 feet and contains almost two-thirds of the sea's total volume of water. The legal status of the Caspian area is complicated due to lack of agreement on whether the body of water is defined as a 'sea' or 'lake'. Different international laws would apply in each case. Currently, there is no set legal definition for the Caspian because the coastal states must unanimously agree on a definition. The dissolution of the Soviet Union created different legal interpretations of existing legal treaties between the Soviet Union and Iran related to the ownership of the Caspian Sea. Given the lack of an agreement on whether the Caspian is a 'lake' or a 'sea', two sets of public international law could apply. If the Caspian is a 'sea' in legal terms, coastal countries would apply the United Nations Convention on the Law of the Sea of 1982 (UNCLOS). If the Caspian is legally defined as a 'lake', the countries could use the international law concerning border lakes to set boundaries. Historic treaties form the basis of the current legal status debates. The Soviet government annulled pre-existing treaties between the Russian and Persian Empires and established the 1921 Treaty of Friendship as the basis for bilateral relationship between the Soviet Union and Persia. This treaty focused heavily on navigation rights, and the only reference to natural resources came from fisheries agreements. A 1940 treaty states that the Caspian is "regarded by both contracting parties as a Soviet and Iranian Sea." After 1991, newly-independent Azerbaijan, Kazakhstan, and Turkmenistan challenged the legal validity of the Caspian treaties under the 1978 Vienna Convention on Succession of States in Respect of Treaties. Because the countries could not agree unanimously on the Caspian's legal status, the coastal countries operate in a mix of unilateral and bilateral actions, based on differing economic and political interests. For example, Russia and Kazakhstan agreed to set maritime boundaries so that both sides could develop oil resources in their respective sectors. Under UNCLOS, if the Caspian is a legal 'sea', each littoral state receives a territorial sea up to twelve nautical miles, an exclusive economic zone (EEZ) up to nautical 200 miles, and a continental shelf. Since the Caspian at its widest is less than 200 miles, UNCLOS dictates the states apply a median line between claimants. Countries such as Turkmenistan and Azerbaijan would have exclusive access to offshore assets that Iran would not be able to access. If the Caspian is a legal 'lake', international agreements of border states regulate the use of border water. Iran's government has petitioned for equal division by giving each country 20 percent of the sea floor and surface of the Caspian. (UNCLOS, 1982) - Coastal states have 'territorial sea', breadth not exceeding 12 miles, and continental shelf. - Land-locked states (Azerbaijan, Kazakhstan, Turkmenistan) can claim right of access to high seas. Lake Customary international law governing border lakes - Border states regulate use of water through international agreements. - Each state has exclusive rights over resources and water surface in its national sector. - Lakes can be delimited several different ways, such as by coastal line or median line. Generally, either state-owned oil companies or a consortium of foreign companies with state support develop Caspian energy resources. Since gaining independence, Soviet successor states adopted different trajectories in developing national energy resources, from maintaining state control to transferring energy companies to the private sector. Because of the Caspian's strategic location between both Asian and European markets, a wide variety of international firms have invested in the Caspian energy sector along with the national oil companies of the littoral countries. Larger international firms tend to operate through a consortium of several companies in order to jointly invest in major Caspian projects that require enormous upfront costs to develop. After the collapse of the Soviet Union, Russia's oil sector adopted private domestic ownership structures. In 1993, Russia created three joint-stock companies—LUKOil, Surgutneftegaz, and Yukos—to replace the Soviet oil monopoly. At the same time, the entity replacing the Ministry of Gas—Gazprom—retained monopoly ownership along with export monopoly and created 'private domestic ownership with state control'. There was little foreign involvement in Russia's oil and natural gas sector until the late 1990s, when BP bought a 50-percent stake in TNK to form TNK-BP. Azerbaijan involved foreigners in its petroleum industry after achieving independence. International oil companies (IOCs) had been involved in some of the earliest development of Azerbaijan's petroleum industry, including Royal Dutch Shell and the Nobel Brothers Petroleum Company. Azerbaijan has signed the largest number of production-sharing agreements (PSAs) in the former Soviet Union. SOCAR, the country's national oil company, serves as nominal partner in almost all of country's PSAs. It owns the majority of the country's oil and natural gas fields and is responsible for both PSA negotiations and implementation, making it a "one-stop shop" for financial investors. Several smaller publically-owned oil companies, such as UK's Arawak Energy Ltd., have significant investments in Azerbaijan fields, although SOCAR usually maintains around 20 percent interest in the field. A number of international energy firms, such as BP, Chevron, and ExxonMobil, have signed extraction contracts with Azerbaijan and operate through the Azerbaijan International Operating Company consortium (AIOC). AIOC has invested in construction of several pipelines, including the South Caucasus Pipeline and the Baku-Tbilisi-Ceyhan (BTC) Pipeline, and has also invested in extracting oil and natural gas from Azerbaijan's major offshore projects. Kazakhstan also involved private foreign ownership in the oil sector by selling off the majority of shares of Kazakhstan's state oil company. Initially, the government created a state holding company—KazMunaiGas—to oversee oil enterprises inherited from Soviet production in the Caspian basins until foreign companies could take over. Where Azerbaijan's government strengthened SOCAR, the Kazakhstani government did not convert KazMunaiGas into a full-fledged NOC, but rather it sold off its assets to foreign companies. In October 2008, Kazakhstan's government reached an agreement with a number of foreign companies to form the new joint operating company North Caspian Operating Company (NCOC) B.V. This consortium includes equal shares to Royal Dutch Shell, Exxon Mobil, TOTAL, ENI, Kazakhstan's KazMunaiGas, with smaller shares going to other partners such as ConocoPhillips and INPEX. NCOC became the operator of assets formerly held by Agip Kazakhstan North Caspian Operating Company NV (Agip KCO), notably the giant Kashagan field. Smaller petroleum companies have stakes in a variety of Kazakhstan's energy assets. While the NOC KazMunaiGas holds minority positions in some of these assets, Kazakhstan has the most privately-owned assets in the Caspian region. Turkmenistan and Uzbekistan are unique among resource-rich Soviet successor states in that they retained the ownership structure inherited from the Soviet Union—maintaining state ownership with control and discouraging foreign involvement. After declaring independence in 1992, the presidents of both countries asserted that the right to develop petroleum resources belongs to the state and formed fully state-owned oil and natural gas companies. In Turkmenistan, President Niyazov formed Turkmengaz and Turkmenneft for natural gas and oil, respectively, while President Karimov of Uzbekistan formed Uzbekneftegaz to manage both resources. Uzbekistan focused on meeting self-sufficiency in energy by producing from existing fields and increasing the use of hydropower. Total imports of petroleum products dropped from 50,000 bbl/d in 1992 to almost zero in 1996. Turkmenistan's government launched a ten-year development plan in 1993 to become a 'second Kuwait' but restricted the ability of foreign companies to invest in the sector, except for joint venture (JV) contracts with some companies. Heavy restrictions resulted in limited development of Turkmenistan's energy resources, particularly in offshore fields. Dragon Oil, an independent company headquartered in the United Arab Emirates, operates the Caspian offshore Cheleken contract area. Other NOCs such as the Chinese National Petroleum Company (CNPC) and Malaysia's Petronas have invested in Turkmenistan energy assets but do not have significant ownership shares. Iran is the only coastal Caspian country that was not a part of the Soviet Union. The country began to open up the oil and natural gas sector to foreign investment in the mid-1990s, although international sanctions have limited international involvement. The president of Iran chairs the Supreme Energy Council, which was established in July 2001 to oversee the energy sector. The state-owned National Iranian Oil Company (NIOC), under the supervision of the Ministry of Petroleum, is responsible for all upstream oil projects, encompassing both production and export infrastructure. Nominally, NIOC also controls the refining and domestic distribution networks, by way of its subsidiary, the National Iranian Oil Refining and Distribution Company (NIORDC), although functionally, there is a separation between the upstream and downstream sectors. Although endowed with considerable energy resources, the Caspian region faces several challenges to oil and natural gas extraction, including transportation, and finding sufficient investment for major projects. Caspian oil and natural gas fields are located relatively far from export markets, requiring expensive infrastructure to move oil to ports where it can go to world markets. Exports of oil and natural gas tend to rely on old Soviet pipeline networks. This dependence did not matter when all of the littoral countries were part of the Soviet Union and these pipelines served Soviet needs. Once independent, countries could use their geographic position as a bargaining chip in determining export routes for Caspian resources. For example, Kazakhstan agreed to a deal with China in 1997 to construct a Chinese-financed Kazakhstan-China oil pipeline, the first pipeline directly importing oil from Central Asia to China. The difficulty in transporting Caspian energy resources means that major projects, such as Kazakhstan's Kashagan field, require large amounts of foreign investment. The Caspian Sea's periodically freezing waters increase the costs of offshore projects. Companies must use canals from the Black Sea to move drilling and maintenance equipment to production areas near the Caspian Sea. In addition, shifting legal and regulatory frameworks create uncertainty for foreign companies investing in natural resources. For example, the lack of agreed-upon maritime borders between Turkmenistan, Azerbaijan, and Iran has hampered geologic exploration in the southern Caspian basin. EIA estimates 48 billion barrels of oil and 292 trillion cubic feet of natural gas in proved and probable reserves in the Caspian basins. Almost 75 percent of oil and 67 percent of natural gas reserves are located within 100 miles of the coast. Territorial disputes and limited exploration in offshore areas make it difficult to determine the total amount of hydrocarbon resources. Using field-level data, EIA estimates 48 billion barrels of oil and 292 trillion cubic feet of natural gas in proved and probable reserves in the wider Caspian basins area, both from onshore and offshore fields. Because the reserve figures include both proved and probable reserves, the figures are closer to a high-end estimate. Most of these reserves are offshore or near the Caspian Sea coast, particularly near the northern coast. EIA estimates 41 percent of total Caspian crude oil and lease condensate (19.6 billion bbl) and 36 percent of natural gas (106 Tcf) exists in offshore fields. In general, the bulk of offshore oil reserves is in the northern part of the Caspian Sea, while the biggest quantity of offshore natural gas reserves is in the southern part of the Caspian Sea. An additional 35 percent of oil (16.6 billion bbl) and 45 percent of gas (130 Tcf) can be found onshore within 100 miles of the coast, particularly in Russia's North Caucasus region. The remaining 12 billion bbl of oil and 56 Tcf of natural gas are scattered farther onshore in the large Caspian Sea basins, mostly in Azerbaijan, Kazakhstan, and Turkmenistan. As a result of the lack of clear Caspian Sea delineation, several countries dispute ownership over certain offshore resources. For example, Azerbaijan and Turkmenistan both claim the Serdar (Turkmenistan)/Kyapaz (Azerbaijan) field, originally discovered in 1959 by Azerbaijani geologists. (s) = Value is too small for the number of decimal places shown. "Offshore Caspian" refers to fields in the Caspian Sea. "Onshore Caspian" refers to fields in Caspian basins that are not offshore. Proved + Probable reserves exceed the value of 'proved reserves' in EIA's International Energy Statistics. The Caspian Sea may contain additional hydrocarbons in unexplored or underdeveloped areas. 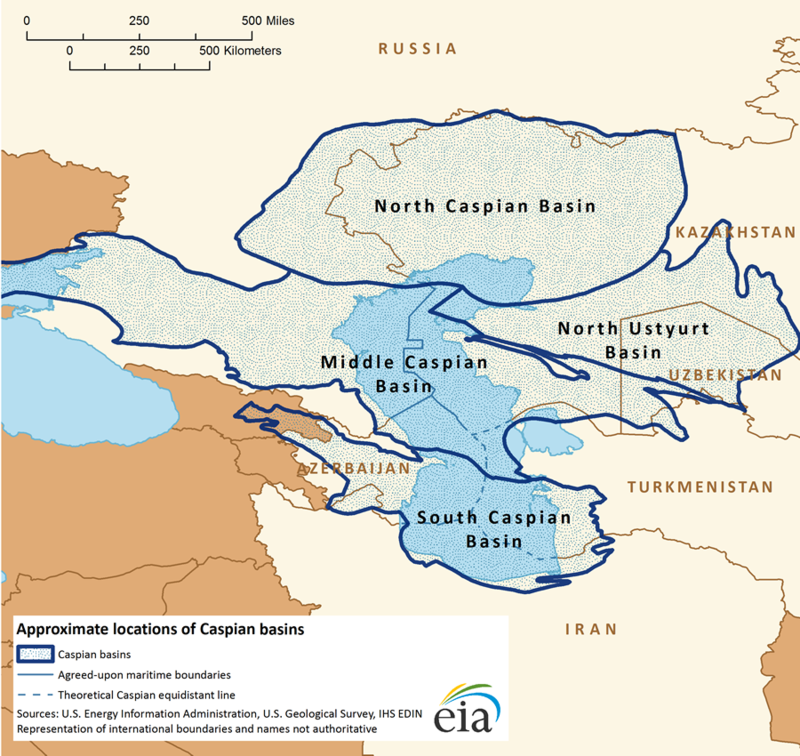 The U.S. Geological Survey (USGS) assessed the Caspian basins region using published geologic information on commercial oil and natural gas field data to estimate undiscovered resources for priority basins around the world. These additional resources are not considered commercial reserves at this time because it is unclear how economically feasible it would be to extract them. The USGS estimates a mean of about 20 billion barrels of crude oil and 243 trillion cubic feet of natural gas in technically recoverable, conventional undiscovered resources. USGS estimates around 65 percent of the undiscovered oil and 81 percent of the natural gas to be in the South Caspian Basin, reflecting the more limited exploration and geologic assessment of the southeastern part of the Caspian Sea near Iran and Turkmenistan because of territorial disputes. The arctic-like north of the Caspian Sea is also relatively unexplored, and USGS estimates significant amounts of undiscovered resources there as well. The Caspian basins area produced an average of 2.6 million barrels per day of crude oil in 2012, around 3.4 percent of world supply, with just over a third of that coming from offshore fields. EIA estimates that the Caspian basin produced an average of 2.6 million bbl/d of crude oil and lease condensate in 2012, around 3.4 percent of world crude oil supply. Around 35 percent of that came from offshore fields in the Caspian Sea, with the rest produced in onshore fields in the Caspian basins. Over half of all Caspian basin oil production comes from onshore fields located less than 100 miles from the Caspian Sea coast. Over the past decade, Kazakhstan's onshore oil fields, particularly the Tengiz field, were the biggest contributor the region's production. As Azerbaijan developed the Azeri-Chirag-Guneshli (ACG) field group between 2006 and 2008, the country's offshore production began accounting for an increasing part of total Caspian production. Other significant sources of Caspian oil include onshore fields in Turkmenistan near the coast and production from Russia's North Caucasus region. While most current Caspian oil comes from onshore fields, the biggest prospects for future growth in Caspian oil production will be from offshore fields, which are still relatively undeveloped. Caspian production accounts for virtually all oil production in some of the region's countries, including Azerbaijan and Turkmenistan, yet only a very small portion for the region's two largest producers, Russia and Iran. In total, production that can reasonably be classified as "Caspian oil" accounts for roughly 17 percent of the total production of the region's countries. 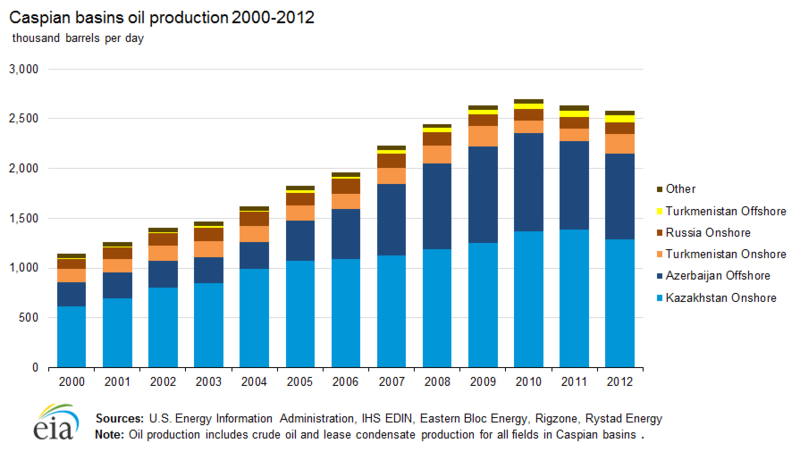 The table below compares Caspian production to total production for the six countries covered by this report. Most of Azerbaijan's oil production comes from the large offshore field complex called ACG after its three principal fields: Gunashli Deep (discovered in 1977), Chirag (1985), and Azeri (1986). A BP-led consortium, the Azerbaijan International Operating Company (AIOC), operates the field group and estimates 5 billion barrels of technically recoverable oil. AIOC includes both Azerbaijan's state oil company SOCAR, as well as foreign companies such as INPEX and Chevron. Oil from ACG transfers to the onshore Sangachal terminal south of Baku via two separate pipelines, and to the onshore Kyanizadag terminal east of Baku. ACG produces mostly Azeri Light, a medium-light and sweet crude that is valued for its high middle-distillate yield. In 2012, Azerbaijan's oil production struggled to meet production targets because of poor performance from AGC. BP and SOCAR agreed to an output stabilization program for 2013 to prevent future declines from the field. Currently, there is no significant Iranian production in the Caspian. Iran claims 100 million bbl of oil reserves from a field discovered in 2011 named Sardar Jangal. The Iranian Oil Ministry plans to establish a refinery on the Caspian coast and supply it with crude oil derived from the Sardar Jangal oilfield, although any development in this area is likely years away. The largest source of oil production in Kazakhstan is the giant Tengiz oil field, discovered in 1979 off the northeastern shore of the Caspian Sea. A consortium known as TengizChevroil (TCO) operates the field, which produced roughly 500,000 bbl/d in 2011. In 2012, however, LUKOil announced that Tengiz production fell short of this production because of adverse weather, and mechanical and transportation problems. The greatest potential for oil production growth in Kazakhstan comes from the giant Kashagan field, the biggest oil discovery in the last 35 years. A consortium known as the Agip Kazakhstan North Caspian Operating Company (Agip KCO), led by ENI, operates the field. Discovered in 2000, it is the largest oil field outside the Middle East, with reserves estimates in excess of 13 billion barrels of oil along with significant natural gas deposits. Development of the Kashagan has experienced significant delays and cost overruns. In 2007, the consortium delayed the estimated time for first oil production to 2010, five years later than original schedule. The consortium estimated that about $30 billion has been spent on the first phase of the field's development. Challenges to production include the field's great depth (15,000 feet below sea bed), high sulfur (H2S), high pressure, and cold temperatures that make it unsuitable for typical fixed or floating platform designs. Kashagan requires offshore facilities installed on artificial islands to protect against pack ice movements. The start of commercial production currently is estimated to be in the third quarter of 2013. ENI forecasts Kashagan's output to reach 200,000 bbl/d by the end of 2013 and then rise to the full phase-one target of 370,000 bbl/d in 2014. Russian production in the Caspian basin traditionally came from onshore fields in the North Caucasus region, particularly from Krasnodar, Stavropol, and Chechnya. According to Eastern Bloc Energy, the North Caucasus supplies Russia with approximately 65,000 bbl/d. In 2010, Russia's LUKOil launched production of the Yuri Korchagin field, the country's first offshore field in the Caspian Sea. Korchagin has become one of the most profitable upstream projects in the Caspian after Russia reduced export duties on its output. Crude output goes to the Makhachkala port in Dagestan to be shipped to the Black Sea port of Novorossiysk via pipeline. Transneft announced plans to expand the Baku-Tikhoretsk pipeline to accommodate increased Russian output from the Caspian to Novorossiysk. LUKOil announced its next plan to increase investment into the Filanovsky field, where it expects to be able to produce 120,000 bbl/d. Aside from oil revenues, development of the northern Caspian gives the Russian enterprises the opportunity to develop new technologies that could eventually be employed in the Arctic. The Korchagin field was the first field in the world to use an ice-class floating storage offloading vessel to protect against the harsh conditions of the northern Caspian Sea. The oil passes through 36 miles of underwater pipelines to floating oil tanks. Most of Turkmenistan's oil reserves are located offshore or in the Garashyzlyk area west of the country. Turkmenistan's government has been developing the offshore Cheleken project since the mid-1990s, which it has opened up to some foreign investment, including UAE's Dragon Oil. Proved and probable reserves in the contract area are around 3 million bbl of oil and 3 Tcf of natural gas. Dragon Oil exported 11.4 MMbbl in 2011 from Turkmenistan's sector, with most of it going through Azerbaijan to be sold to world markets. 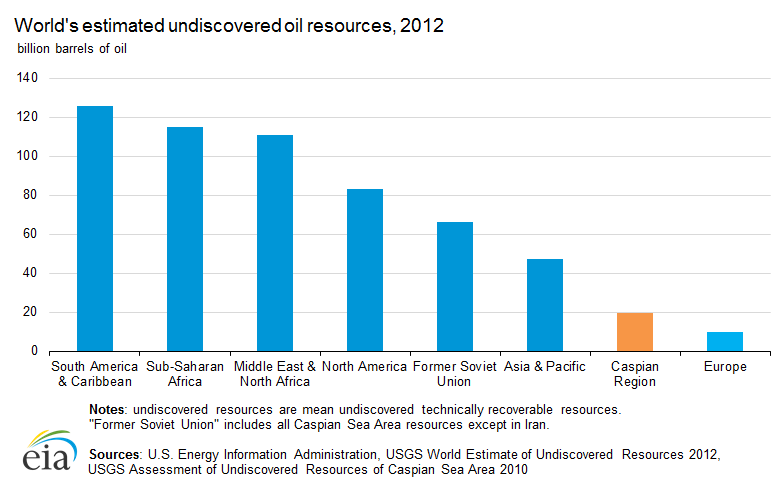 Uzbekistan is not a significant oil producer. Most of the country's known oil reserves are located in the southeast, notably the Kokdumalak field. The USGS estimates significant reserves may be found in the Fergana Basin, which bridges Uzbekistan, Kyrgyzstan, and Tajikistan. However, Uzbekistan has few oil prospects within its area of the Caspian basin. The significant and dispersed nature of Caspian natural gas reserves suggests that future growth in Caspian hydrocarbon production will mainly come from natural gas. While Azerbaijan and Kazakhstan contain the majority of oil resources in the Caspian basins, there are significant natural gas resources in all the region's countries. The biggest discovered natural gas fields are onshore in Turkmenistan, Kazakhstan, and Uzbekistan, as well as offshore Azerbaijan. Russia and Iran also have sizable natural gas deposits. 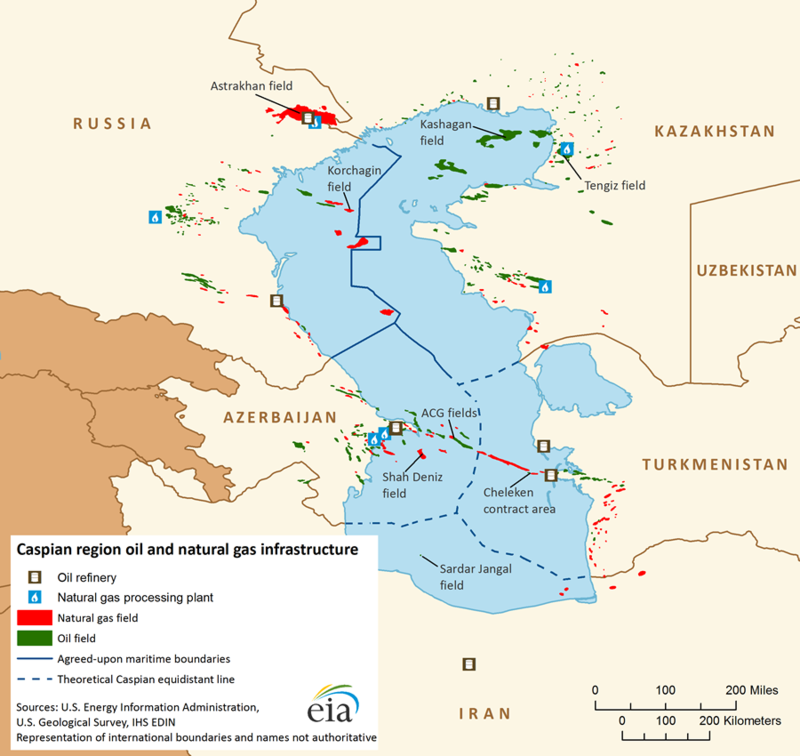 Most of Azerbaijan's and Kazakhstan's natural gas production comes from the Middle and North Caspian basins, with Azerbaijan's production mostly occurring offshore. In contrast to Azerbaijan, Kazakhstan's current production comes from onshore fields. Around a quarter of Kazakhstan's gas production also comes from the eastern part of the country, away from the Caspian basin. Although Turkmenistan is a major natural gas producer, only 12 percent of its production comes from the Caspian area (from onshore fields near the coast). The majority of the country's production comes from fields in the southeast, and generally flows to either to China or South Asia. 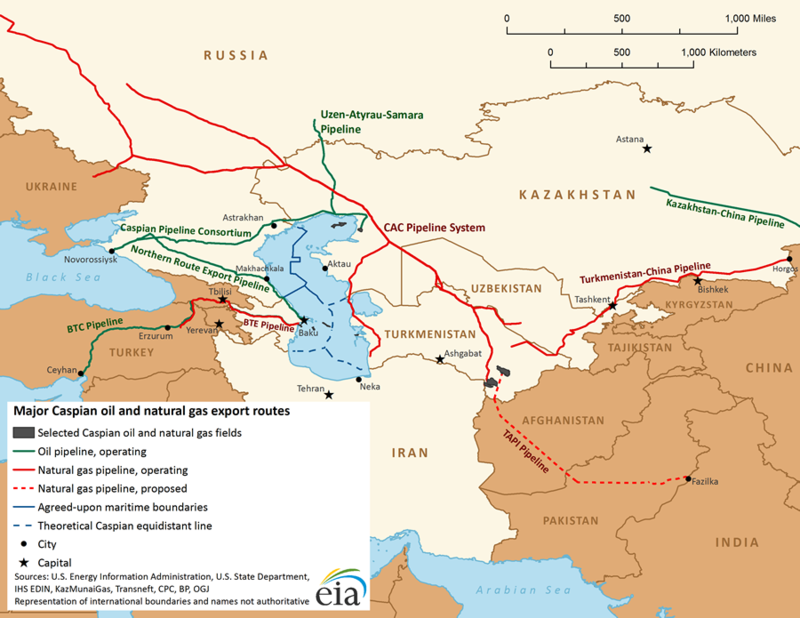 Russia and Iran (and to a much lesser extent Uzbekistan) are major natural gas producers but have virtually no production in the Caspian area. Historically an oil producer, Azerbaijan is emerging as an important regional natural gas producer. Natural gas production comes mostly from the Shah Deniz field, discovered in 1999. Some natural gas production is associated gas from the ACG field group. In total, about 75 percent of natural production comes from offshore fields. Shah Deniz is the largest gas field in the Caspian Sea, located about 40 miles southeast of the ACG complex, in water depths between 262 and 2,000 feet. According to BP (the project's technical operator), Shah Deniz contains potential estimated reserves of roughly 30 Tcf of natural gas. Phase 1 of the development came onstream in late 2006 and began supplying natural gas to Georgia and Turkey a year later through the South Caucasus Gas Pipeline (SCP). Azerbaijan's gas export capacity is tempered somewhat by rising domestic gas consumption, particularly in the power sector where Azerbaijan is replacing Soviet-era equipment with new combined-cycle gas turbines (CCGTs). Although Russia is one of the world's largest natural gas producers, very little of that production currently comes from the Caspian region. Gazprom operates a large gas-condensate field and associated processing complex in Astrakhan and produces small amounts of natural gas from a handful of fields in the North Caucasus. Russia's LUKOil considers the northern Caspian region as a key driver of increased oil and natural gas production in the medium term, particularly from the Filanovsky oil and natural gas field. Industry sources suggest the field has 1 Tcf of natural gas and 1.1 billion barrels of oil in proved and probable reserves. The majority of Kazakhstan's natural gas production comes from the large Tengiz oil field. The field's operators are currently testing a project to reinject the flared gas into the field to boost oil recovery. Because it is landlocked, Turkmenistan generally focuses on exporting natural gas through pipelines rather than as liquefied natural gas (LNG). The country received significant investment for gas field exploration in the 1980s, making it the Soviet Union's then second-largest supplier of gas. Turkmengaz operates the country's two largest fields, Dauletabad and Malai, which are oriented towards exports and account for the majority of the country's production. The British company Gaffney, Cline, and Associates carried out the first independent audit of Turkmenistan's gas reserves in 2008 and 2009. Their report suggested that the country contains the world's fourth largest natural gas field, the South Yolotan-Osman, which was renamed Galkynysh in 2011. Turkmenistan's national gas company Turkmengaz controls onshore gas production and has limited access to international companies. In 2007, CNPC signed a production-sharing agreement with Turkmen authorities to develop natural gas fields in eastern Turkmenistan, as well as potentially exploring the Galkynysh field. 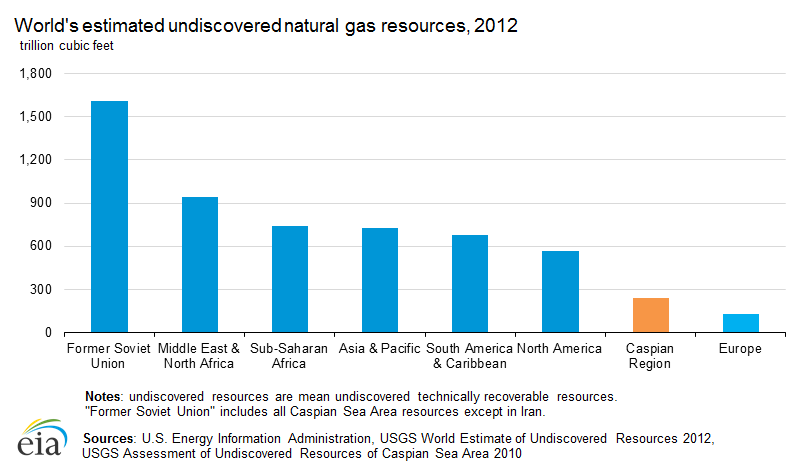 Iran and Uzbekistan are both major natural gas producers but do not have significant production in the Caspian basin. Industry sources suggest around 50 Tcf of gas in Iran's Sardar Jangal offshore field, while Iran's Ministry of Petroleum has claimed much higher numbers of offshore natural gas proved reserves in the Caspian. * Although not geologically part of the Caspian basin, these projects are included because they link up to Caspian region infrastructure. NOTE: No projects detailed for Uzbekistan and Iran. Sources: U.S. Energy Information Administration, BP, ENI, Chevron, IHS Edin, Platts, Dragon Oil. Caspian oil and natural gas producers have struggled to move their products to world markets. Some countries cooperate and jointly develop export capacity, while others focus on attracting enough investment to create their own routes. The Caspian's coastal countries, along with Uzbekistan, together have an operating crude oil refining capacity of just over 8 million barrels per day, according to Oil and Gas Journal. Russia and Iran together make up about 85 percent of this capacity. As of January 2013, the total crude oil refining capacity of the coastal countries was about 9 percent of the world's total crude refining. Russian refineries are scattered throughout the country, whereas much of Iran's refining capacity is located near its main producing fields and major demand centers. Refineries in the Caspian basins tend to service major fields, usually to produce refined products for domestic consumption or small amounts of exports. Crude oil not refined in the region is usually pumped to wider pipeline networks, where it can go to refining centers in Western Europe and China. There are currently seven operational crude oil refineries within 100 miles of the Caspian Sea with a total crude capacity of 964,000 bbl/d. This is approximately 12 percent of the total refining capacity of the countries, although all of Azerbaijan's and Turkmenistan's refinery capacity is in this area. Azerbaijan and Turkmenistan both have two operational refineries near the sea, while Russia, Iran, and Kazakhstan each have one. Uzbekistan's three refineries are located in the southeast of the country, far away from the Caspian basin. Azerbaijan has the biggest refining capacity in the area from its two refineries operating near the capital of Baku with a refining capacity of just under 400,000 bbl/d. Dagestan Oil operates a small refinery on the Caspian coastal city of Makhachkala, the capital of Russia's Dagestan oblast. Gazprom also operates a condensate splitter in nearby Astrakhan that takes in condensate from the large gas-condensate field north of the city. KazMunaiGas operates Kazakhstan's third largest refinery in Atyrau, just north of the Caspian Sea. Atyrau may potentially service the Kashagan field once oil production ramps up, and Kazakhstan's government has considered building additional refineries in the area to service Kashagan. Turkmenistan's two refineries on the Caspian coast together process most of the country's annual crude output. Finally, while Iran does not produce oil from the Caspian region, NIOC's refinery in Tehran takes in some crude oil from the Caspian Sea under oil swap agreements (see section below). Although the Iranian government has considered constructing a refinery in the port city of Neka, construction has been delayed. Source: U.S. Energy Information Administration, Oil and Gas Journal Worldwide Refineries January 2013, IHS EDIN. There are seven operational gas processing plants within 100 miles of the Caspian Sea. Rosneft and LUKOil each operate one plant in the North Caucasus. Kazakhstan and Azerbaijan have three and two gas processing plants, respectively, to process natural gas from their major Caspian oil and natural gas fields. Azerbaijan 2 2 SOCAR runs gas processing plants for Caspian basin fields, including Shah Deniz. Kazakhstan 14 3* TengizChevrOil runs a gas processing plant to pick up associated gas from the Tengiz oil field. Agip KCO of NCOC building processing plant to handle associated gas from Kashagan. Russia 37 2 Gazprom and LUKOil run gas processing plants for natural gas from the large Astrakhan field and smaller gas fields in North Caucasus. Turkmenistan 2 0 Iranian company Ramshir currently building processing plant for Korpezhe field to service the Iranian market. * Gas processing plant to service Kashagan field is under construction. Sources: U.S. Energy Information Administration, IHS Edin, IHS Global Insight. Historically, Caspian oil and natural gas producers have lacked sufficient export infrastructure. The coastal countries have developed several approaches for international exports. Some countries cooperate and jointly develop oil export capacity, while others focus on attracting enough investment to create their own routes. Kazakhstan and Azerbaijan have had the most success in developing oil export capacity through the construction of the CPC and BTC pipelines, which have become the main transit routes for Caspian oil. Baku-Tbilisi-Ceyhan(BTC) Operating Crude oil 1,000,000 bbl/d Kazakhstan-Azerbaijan-Georgia-Turkey ACG, Shah Deniz, Tengiz BTC Pipeline Co. Traditionally, Caspian oil and natural gas went directly to Russia through the Soviet pipeline system, where some of it could go to Western markets. Investors have refurbished Soviet-era pipelines to take oil from fields that are offshore or near the coast that can be barged across the Caspian Sea. The Caspian Pipeline Consortium (CPC) oil pipeline, commissioned in 2001, runs from Kazakhstan's Tengiz oil field to the Russian port of Novorossiysk on the Black Sea. The consortium transported an average of 684,000 bbl/d of crude oil in 2011, including 608,000 bbl/d from Kazakhstan and 76,000 bbl/d from Russia. In addition, approximately 53,000 bbl/d of Tengiz crude was discharged at Atyrau, Kazakhstan, for loading onto rail cars. In 2011, CPC partners began the expansion of the pipeline capacity to 1.4 million bbl/d. The project will be implemented in three phases, with capacity increasing until 2016. The expansion is expected to provide additional transportation capacity to accommodate increased production from Tengizchevroil. The Baku-Novorossiysk pipeline is 830 miles long and has a capacity of 100,000 bbl/d. The pipeline runs from the Sangachal Terminal to Novorossiysk, Russia on the Black Sea. SOCAR operates the Azeri section, and Transneft operates the Russian section. An ongoing dispute between SOCAR and Transneft concerning transportation tariffs occasionally complicates the pipeline's operation. There are proposals to increase the pipeline capacity to between 180,000 and 300,000 bbl/d, a key transportation addition as production grows in the ACG oil field and throughput from Kazakhstan increases in the future. In 2010, Baku-Novorossiysk transported approximately 45,500 bbl/d. Since the collapse of the Soviet Union, European countries have begun investing in alternative export routes. The Baku-Tbilisi-Ceyhan (BTC) pipeline is a 1-million bbl/d line in Azerbaijan, which came online in 2006. Kazakhstan has a contract with Azerbaijan and the BTC Pipeline Company to ship up to 500,000 bbl/d of oil via the BTC pipeline. Kazakh oil supplies were loaded into the BTC for re-export for the first time in October 2008. Oil supplies are delivered by tanker across the Caspian to Baku. The BTC pipeline system runs 1,110 miles from the ACG field in the Caspian Sea, via Georgia, to the Mediterranean port of Ceyhan, Turkey. From there the oil is shipped by tanker mainly to European markets. Kazakhstan's other major oil export pipeline, Uzen-Atyrau-Samara, is a northbound link to Russia's Transneft distribution system, which provides Kazakhstan with a connection to world markets via the Black Sea. The line was upgraded in 2009 by the addition of pumping and heating stations and currently has a capacity of approximately 600,000 bbl/d. Before the completion of the CPC pipeline, Kazakhstan exported almost all of its oil through this system. Kazakhstan is plan on constructing the Kazakhstan-Caspian Transportation System (KCTS). The plan is to export oil produced primarily at Kashagan and Tengiz to international markets via the East-West energy corridor along the route Eskene-Kuryk-BTC. The oil would be transported through the future Eskene-Kuryk pipeline on the Kazakh Caspian coast to an oil terminal where it would sail to Azerbaijan, and from there on through the BTC pipeline. KTCS expected to supply 300,000 bbl/d through BTC to global markets, gradually increasing to 800,000 bbl/d. Foreign investment will fund part of the project, estimated by KazMunaiGas to cost $4 billion. Caspian natural gas moves to Western Europe through a combination of Soviet-era and newly constructed pipelines. The Central Asia-Center gas pipeline system (CAC), built between 1960 and 1988, carries Caspian Sea natural gas north to Russia where it links up with the wider Soviet gas pipeline network. The two branches of CAC, controlled by Gazprom, meet in the southwestern Kazakh city of Beyneu before crossing into Russia at Alexandrov Gay and feeding into the Russian pipeline system. The eastern branch of the pipeline, which has a throughput capacity of 2.2 Tcf, originates in the southeastern gas fields of Turkmenistan. The western branch (120 Bcf) originates on the Caspian seacoast of Turkmenistan. Almost all Turkmen and Uzbek gas is delivered via the eastern branch. The western branch is more than 35 years old, and sections of it are in disrepair, causing periodic operational problems. The South Caucasus Pipeline (SCP) runs parallel to BTC and supplies natural gas to Georgia and Turkey from Caspian fields. The pipeline began operating in 2007 and has the capacity to transport about 280 Bcf of natural gas, according to IHS Global Insight. In 2010, SCP daily throughput averaged 180 Bcf of natural gas, according to BP. As Chinese oil consumption has increased, the country has begun investing in Caspian oil and natural gas production to supplement oil from Russia's East Siberia region. Japan is also interested in Caspian oil and natural gas to feed growing demand, and the Japan Bank for International Cooperation has expressed interest in financing pipeline projects, such as the Caspian Pipeline Consortium, that could bring more oil to world markets. Currently, the main avenue for delivering Caspian oil to East Asian markets is the Kazakhstan-China oil pipeline, which spans 1,384 miles from Atyrau port in northwestern Kazakhstan to Alashankou in China's northwest Xinjiang region and has a crude transportation capacity of 240,000 bbl/d. The pipeline is a joint venture between CNPC and KazMunaiGas, which built the pipeline in segments and began commercial production from Phase 3 in 2009. The pipeline is currently being expanded to increase capacity to 400,000 bbl/d. The additional capacity will be used to transport some Kashagan oil. The Turkmenistan-China gas pipeline transports most of the Caspian region's natural gas exports to East Asia. Turkmenistan's eastern natural gas fields, including Galkynysh and the Bagtyyarlyk field group, feed the pipeline, which then enters Uzbekistan and runs to southern Kazakhstan. The pipeline crosses the Kazakhstan-China border at Khorgos and connects to the West-East Gas Pipeline. The pipeline's partners are expanding the pipeline to receive natural gas from Kazakhstan's western fields, such as Tengiz and Kashagan. India and Pakistan have also seen energy demand rise, and for several decades a consortium of countries has planned to construct a pipeline that runs from Turkmenistan to India. This would allow Turkmenistan to supply the growing South Asian markets and diversify its natural gas exports. According to Oil and Gas Journal, the proposed Turkmenistan-Afghanistan-Pakistan-India (TAPI) pipeline would run approximately 1,050 miles; 90 miles will be in Turkmenistan, 460 miles in Afghanistan, and 500 miles in Pakistan, bringing it to the Indian border. The pipeline would have a 1 Tcf capacity. India and Pakistan will each get approximately 42 percent of natural gas pumped through TAPI, with the rest going to Afghanistan. Iran engages in trades called oil swaps by importing oil from Central Asian countries that is sent to refineries in Tehran and Tabriz. Iran then delivers an equivalent amount of oil to potential buyers in the Persian Gulf, bypassing the challenge of getting Central Asian oil to global markets. According to the United Nations, Iranian oil swaps with Kazakhstan reached around 27,000 bbl/d in 2005, rising to 82,000 bbl/d in 2006. Iran has plans to develop the coastal infrastructure at its northern port city of Neka and raise swap capacity from an estimated 200,000 bbl/d to 500,000 bbl/d in the initial phase, followed by further expansions to 1.5 million bbl/d and 2.5 million bbl/d through medium-term and long-term development. In the past, trading firms Vitol, Select Energy, Litasco, Silk Road, and Ocean Energy all had swap arrangements with Iran. UAE-based Turkmenistan producer Dragon Oil sold most of its crude oil through the Iranian port of Neka until July 2010. Data presented in the text are the most recent available as of August 26, 2013. Energy Charter Secretariat (2008). "Oil flows and export capacity in the Caspian and Black Sea regions."